Media Report : Google Spain in the Netherlands III: does convicted murderer have ‘right to be forgotten’? Google Spain in the Netherlands III: does convicted murderer have ‘right to be forgotten’? The ground-breaking Costeja González judgment of the ECJ was followed in the Netherlands by several proceedings about the ‘right to be forgotten’. This was also the objective of recent preliminary relief proceedings brought by a convicted killer. Having served his term, he has been trying to erase all online links between his name and the crime. In these attempts he met with resistance from an interest group and the father of his victim, who make online publications about the murder. The killer started preliminary relief proceedings for the removal and keeping removed of publications of the defendants containing both his name and details of his crime. The Court in preliminary relief proceedings ruled (pdf) that the publications need not be taken offline. Previously, the claimant had been successful with Google. By making a ‘right to be forgotten’ request he had removed a number of search results from Google (referring to websites that featured his name in connection with his crime). 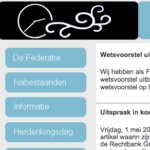 The father of the claimant’s victim had discovered this and had published an article on the website of the Dutch Federation of Surviving Relatives of Victims of Violent Crime, as well as the claimant’s request to Google (which he had found on chillingeffects.org). In the article the full name of the claimant was used, which restored the previous situation: when searching on Google for the claimant’s name, the first hit was the website of the Federation. The claimant claims the removal of these documents from the website, as well as an order for the defendants to “refrain from making any publications containing personal data of the claimant in the future”. His claims are based on the Costeja González judgment and the Dutch Personal Data Protection Act (PDPA). The first question to be asked in this context is: is the processing necessary? It is, says the court, since the defendants have a legitimate interest in keeping the memory of what has happened alive. If they wish to defend this interest, reaching an audience as broad as possible – for example through the Internet – is ‘necessary’ within the meaning of the PDPA. In this case (according to the Court), the murder happened only 10 years ago. Moreover, the claimant is still subject to a hospital order and has not shown any understanding of the gruesome nature of his acts. This makes the claimant’s interest limited. “In our society we agree that we have to act with great restraint when restricting the possibilities for citizens to express themselves in words, also if such expressions concern other persons. After all, expressing one’s thoughts and feelings to others is essential of being human. There is no such exceptional case here. The court observed in this context that it is relevant that the defendants are not using their freedom of expression in an “excessive” way, “for example by only publishing the claimant’s name in order to harm him”. The Court considered the motives of the defendants to be “respectable”. Apart from the freedom of expression, the Court also held that the public “[has] a great interest in having access to information about serious offences”. This means that freedom of information is also at stake here. Given the significant interests of the defendants on the one hand and the limited interest of the claimant on the other hand, the balance of interests is in favour of the defendants. The judge denies all claims. The result is quite remarkable; in this case the judge goes along with the publishing and keeping published for a long time of the full name of convicts (at least where it concerns serious crimes, such as this one). Apparently, 10 years is thought of as a relatively short time. The judgment is in line with a previous judgment of the preliminary relief judge in Amsterdam, in which a conviction for a serious crime was also considered to be “in general permanently relevant information about a person”. In that judgment the court also held that anonymizing the name of suspects or convicts is only a journalistic tradition in the Netherlands, but does not amount to an “enforceable standard”. Incidentally, these preliminary relief proceedings have backfired: several popular websites have already reported on this case, quoting the full name of the claimant (the notorious Streisand effect).